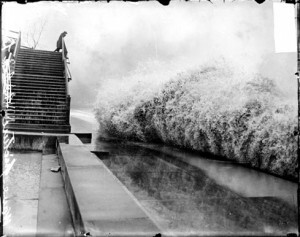 Wave breaking on the shore of Lake Michigan by Lincoln Park while a man watches from High Bridge Chicago Daily News, Inc., photographer. Published 1913 Nov. 10. Photo courtesy of Library of Congress, American Memory Project. Honoring all hands lost at sea has been a ubiquitous ritual of life in the Great Lakes State. 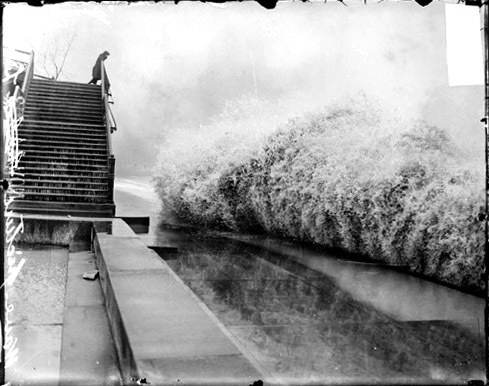 Despite the beauty of the Lakes, we are always fearful of the next Great Lakes Storm of 1913, or a November gale. Earning a living from the Lakes has never been an easy task, and we honor that struggle, sometimes in very creative ways. Were you aware of the monument to those lost at sea that lies at the bottom of Little Traverse Bay? 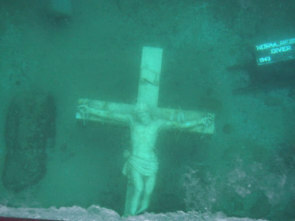 A 1,850-pound, Italian marble Crucifix rests there, about 800 yards off Sunset Park in Petoskey. Officer Denny Jessick of the Emmet County Sheriff’s office has long invited the public to view this memorial through the ice. These viewings began in 1986, around the same time that the Crucifix was moved from it’s original site, about 1200 feet off the Petoskey breakwall, where it was placed in 1962 by the U.S. Icebreaker Sundew. This is a unique event honoring our communion with the Great Lakes, and a respectful (albeit fun) way to introduce people young and old to the history of that communion. 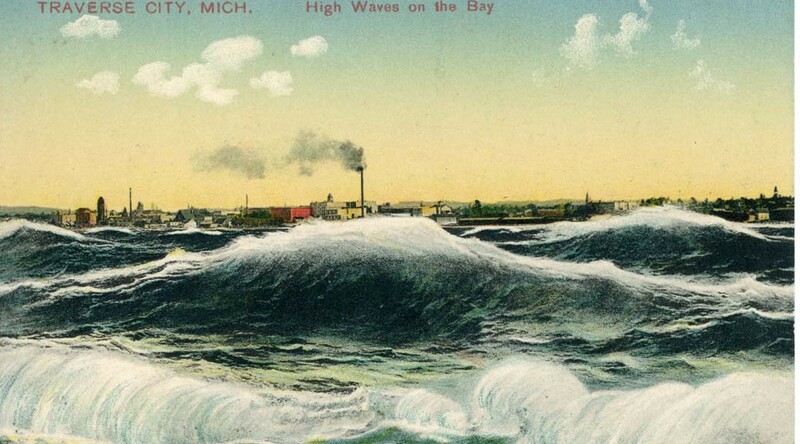 A fun historical tidbit to throw out there while you’re on the ice: of the 12 ships lost at sea during the Great Lakes Storm of 1913, 4 are still missing. The most recently found was the Henry B. Smith, likely discovered in June 2013. 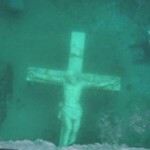 Petoskey’s underwater crucifix, image courtesy of Emmet County government. That’s right readers, time for a History Road Trip! The viewing of the Crucifix is always free and takes place if the ice is thick enough; Look for a tent at the viewing area. Viewing dates are publicized on the County home page, www.emmetcounty.org, in the Petoskey News-Review, and on local Chamber of Commerce web sites. “I love to watch the jumpers when I water my houseplants,” she said. “Whenever I water them, you can see little bugs jump up. Want to see them?” She went to get her watering can. As she soaked the largest plant, a Norfolk Island Pine, I could see nearly microscopic beings jumping several inches from the soil. Some years ago, when I first began to study ecology, the class set up a Berlese funnel, a device designed to capture animals in the leaf litter, the topmost layer of the forest floor. It consisted of a large metallic funnel into which a sample of leaves, sticks, and soil had been placed. Above was an incandescent bulb, low wattage, which provided the heat required to bake the critters out. As the sample dried, they would migrate to the narrow part of the funnel, eventually falling into a jar of alcohol. The menagerie of tiny animals was too diverse to describe in detail here, but one inhabitant was both abundant and memorable: springtails. Springtails are only a millimeter or so long, only visible to our eyes if we are paying careful attention. They have six legs and an odd lever at the end of their abdomens that springs forward, propelling them up in the air. In the past they were regarded as insects, but now, in the day of DNA analysis, they have been removed from that taxon. They are now classified in their own taxonomic group Entognatha, that name pointing to the animal’s internal mouthparts. 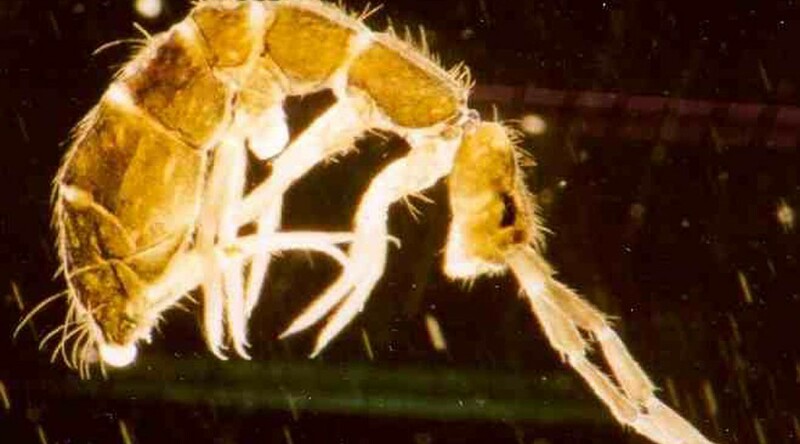 Mostly springtails live on dead and decaying plant matter. They are partly responsible for converting the dead leaves of autumn into black humus. It takes hordes of them to accomplish that work: one estimate of their abundance suggests there might be at least 100,000 of them per square meter. In winter, not all species of springtails are dormant. On warm days some of them—snowfleas as they are commonly called–can be seen hopping on the granular snow, sometimes discoloring it with their tiny bodies which measure less than a millimeter in many cases. They have small lever affairs on their abdomens that are under tension when locked in position. When aroused, they unlock the mechanism and spring upwards, sometimes 50 or 100 times their body length. One wonders how much fun that must be! Richard Fidler is co-author of Grand Traverse Journal. 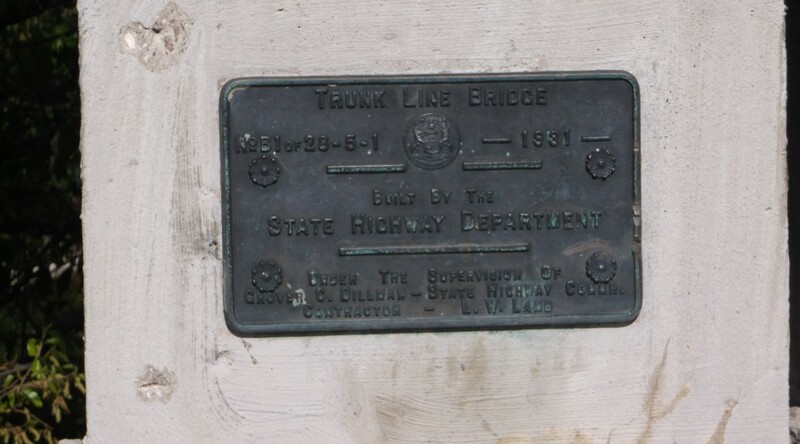 Plaque to Navigate old Traverse City Stumps Readers! In a dramatic turn of events, your editors finally stumped the readers! Next time you’re crossing Union Street south, take a look for this plaque, and astound your friends with your new-found knowledge! Editor’s note: Typically, Grand Traverse Journal focuses on the five-county area surrounding the Bay. 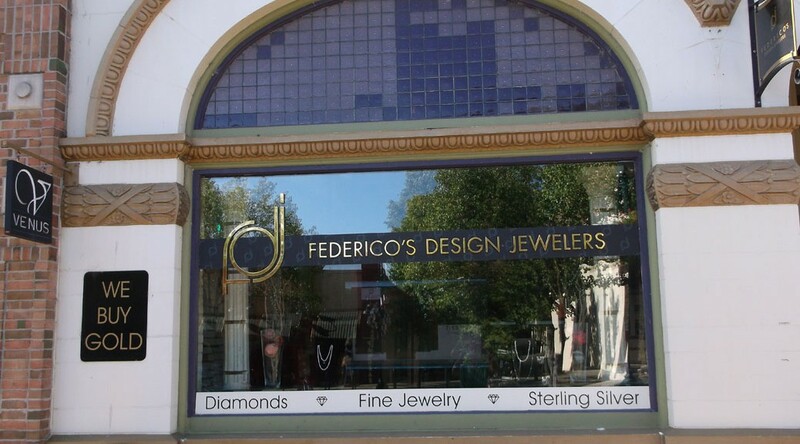 However, this article features our southern neighbor, Cadillac, located in Wexford County, a community that lived through the same growing pains as any in the Bay region. This is but one article in Mr. Sjogren’s new book, “Timber Town Tales,” a collection of 38 articles on Cadillac and Wexford County, originally published in 2014 in the Cadillac News. Thanks to our area’s remarkable history, my retired life has been enriched immeasurably by my varied museum volunteer projects. When we launched our website a few years ago through the Cadillac News web service, CNDigital Solution, I somewhat thoughtlessly agreed to handle viewers’ questions submitted to our website. Since then, I have responded to hundreds of inquiries from all over the U.S. and many foreign countries. Because the site is “name & place searchable,” many inquiries are from Sweden and other northern European countries seeking long-lost relatives. Most foreign inquiries, however, come from Ireland. The Irish, too, have a Wexford County Museum and I rather enjoy responding to those who mistakenly find us as they seek information from our namesake county museum in Ireland. 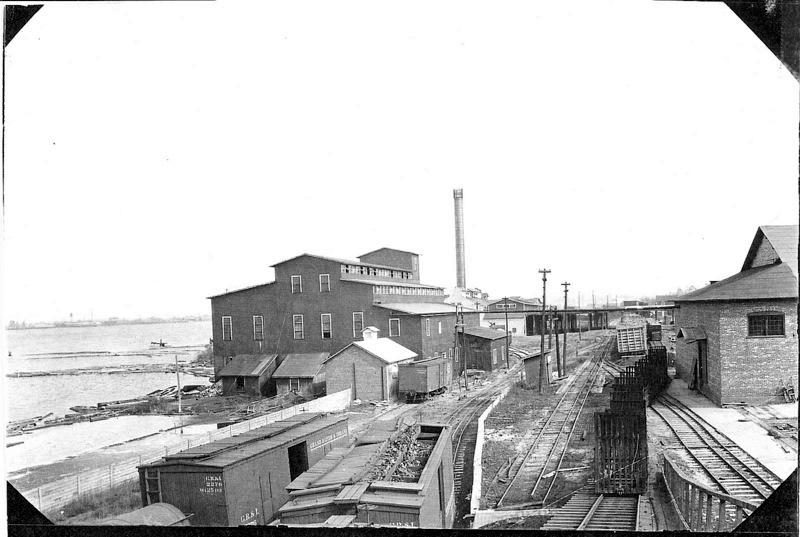 Cadillac Chemical Company on Lake Cadillac’s southeastern shore. The company provided wood alcohol to British and French armed forces during WWI. A mysterious fire was said to be caused by a German saboteur in 1916. Photo courtesy of Wexford County Historical Society. 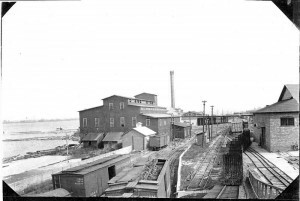 May 18- The Cadillac Chemical Co. group of buildings was destroyed by fire starting about noon. The company was making chemicals for war purposes and its product was in the greatest demand in the concern’s history at high prices. The loss is estimated at $50,000. Next day Charles T. Mitchell, president, said the plant would be rebuilt as soon as possible. My researcher friend was delighted with our find that validated his supposition. No mention of the fire was included in a feature story about the chemical plant. The facility was located in the Cobbs and Mitchell complex about where a Pearl Street extension would end at Lake Cadillac on Holly Road. Their products included wood alcohol and acetate of lime, both used in teh manufacture of explosives. They also made pig iron from the charcoal residue. According to the inquirer, the company’s products were shipped to England and France for their military uses against the Germans prior to America’s entry into the war in 1917. Another interesting inquiry concerned toasters. “Did you know that your community is historically significant as a maker of toasters?” was the question. It was submitted by the editor of the Saturday Evening Toast (no joke!) 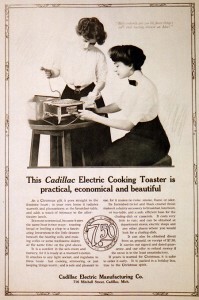 who claimed that a small firm, the Cadillac Electric Manufacturing Company, was the second U.S. manufacturer of toasters. General Electric made the first toasters. 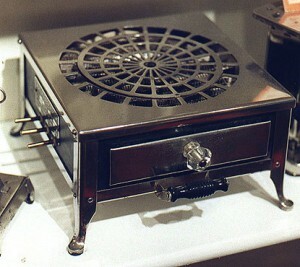 Cadillac Type C Combination Stove & Toaster, Circa 1911. Photo courtesy of Terry Vollmer, http://toast2go.tripod.com . The toaster, depicted here, was a combination stove and toaster that was engineered to have the entire breakfast prepared for eating at the same time. One ad displays a man reading his morning paper and drinking coffee while his breakfast was being prepared beside him. 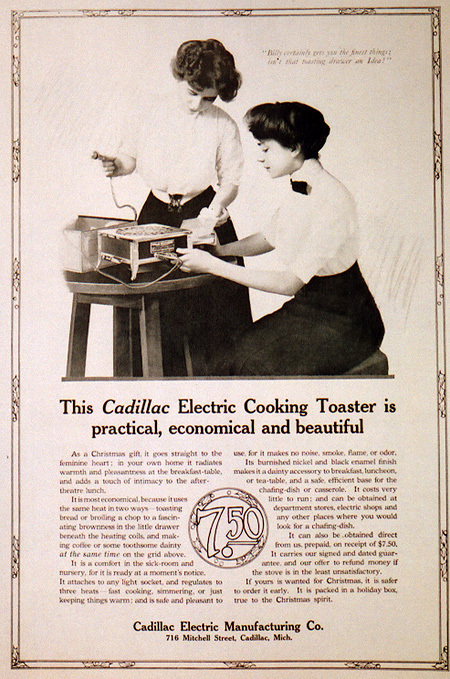 Search “Cadillac Toaster” online and enjoy several views of a product created and manufactured in Cadillac and still displayed at toaster-collector conventions around the U.S. Unfortunately, we do not have this important historical product to display and we would be most appreciative if one were to be gifted to the Society. Our very active website with its 150 hits a day continues to yield a number of historical events that might never have otherwise been revealed. 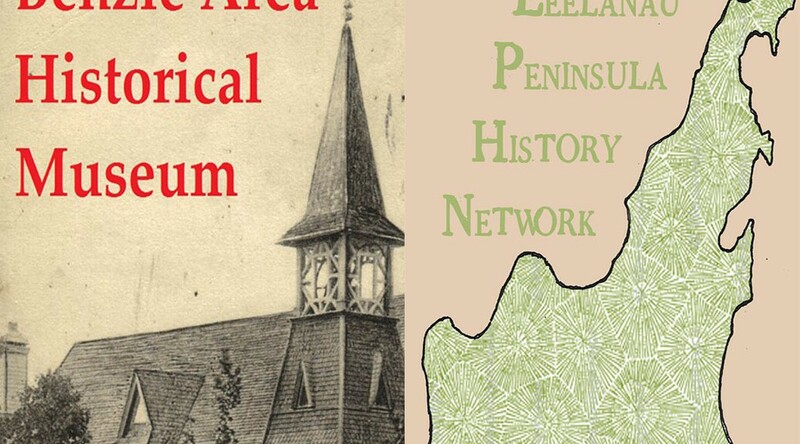 Dr. Cliff Sjogren is a volunteer for the Wexford County Historical Society & Museum, and was highly involved with the newspaper digitization and indexing project recently undertaken by the Society. His book, Timber Town Tales, is his first book on local history, and is available for purchase at Horizon Books, Traverse City and Cadillac, as well as through the publisher, Cadillac Printing Company, Inc. (http://www.cadillacprintingco.com/). All money generated by book sales beyond printing and mailing costs will be donated to the Society. 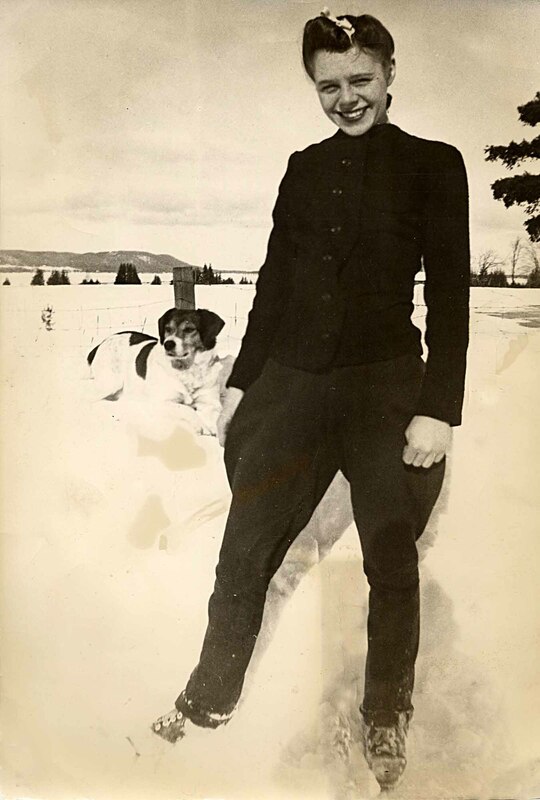 Sjorgen enjoys history, Alpine skiing, and his hometown of Cadillac, Michigan, where he resides with Patricia, his wife of 62 years. Advertisement courtesy of Terry Vollmer, http://toast2go.tripod.com. What’s So Special about this Glass? When Grand Traverse Herald began publication in 1858, the editors began tracking the freezing dates of Grand Traverse Bay. Perhaps not the most thrilling of past-times, but Bay Freeze dates have long been used as a measure of weather and forecasting. Imagine living in a dirt settlement, tracks where roads would someday be built, and you rely on your farming abilities and that of your neighbors to get you through the winter. Supplies come in by train, but dangerous conditions, flooding, wrecks, anything that interrupts that supply line could spell disaster. To top that off, you’ve just moved to the region, perhaps from Bohemia, and have no idea what an “average” winter might be like. Stories from frontiersmen might be helpful, but how can you know? Just as we do now, people tracked weather patterns and made other observations, like when the Bay froze over or when the ice finally melted, to establish these crucial time frames for planting and harvesting, for running timber on the rivers, and other life-sustaining activities. We know this data was important to all: freeze dates, ice storms, and other weather phenomena are recorded not just in newspapers of the time, but in the journals of men and women. Being aware of how the weather acted on average was of the upmost importance for every member of the community. When was the last time you watched the Bay freeze over? Please click on the article below to open larger, readable images, and take some time out of your day to consider the Bay!